Rish Park's many amenities make an overnight stay very enjoyable. Eight cabins provide lodging for individuals, families, and large groups. Some cabins are dormitories with kitchens; others are family cottages that sleep up to seven people. 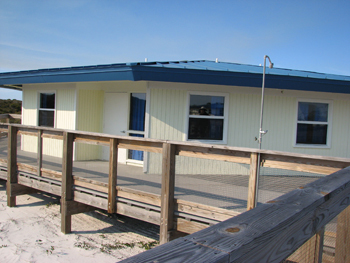 Wide boardwalks connect the cabins with the beach, pool, and an event hall with a complete cooking facility. Bring your own food and have a ball! Only individuals with disabilities may rent cottages and dormitories or use the park facilities. Family members or guardians accompanying people with disabilities are welcome, as are state or private caregivers who transport and assist them. The park is open 12 months a year, and is especially popular in the summertime. The cost for overnight stays is $15 per night, per person. For groups of more than 60, it is $10 per night, per person. Large groups can rent the entire park for $650 per night. Family cottages are available for $15 per night, per person, with a minimum of $30 per night. Both cabins have a maximum capacity of 7 guests. Family Cabin 1 is furnished with 1 set twin size bunk beds and 3 queens with one queen that is a lift bed. It has 2 accessible showers. Family Cabin 2 is furnished with 1 set of twin size bunk beds, 2 queens and a twin size lift bed. It has 1 accessible shower and 1 standard shower. Fees are subject to an 12 percent tax (7 percent sales tax and 5 percent bed tax). 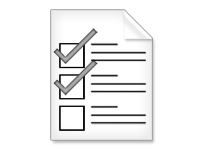 Tax-exempt status is recognized for qualified facilities and organizations.